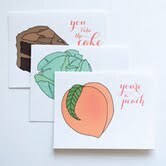 Lily Jane Stationery is a collection of hand illustrated paper goods created by Meredith Church. Each product – from social stationery to wall prints, toy bin tags to calendars – features Meredith’s whimsical illustrations. The designs are simple, clean and colorful. Everything is printed on recycled paper and 10% of all proceeds are donated to March of Dimes in honor of the Meredith’s beautiful daughter, Lily.